Last year saw a handful of acclaimed documentaries that gained national popularity, including Sarah Polley’s Stories We Tell, Morgan Neville’s 20 Feet from Stardom and Joshua Oppenheimer’s The Act of Killing. Less well known was another documentary that is just as fascinating and memorable by Siri Anderson and Kathleen Hanna called The Punk Singer and is now available on DVD for San Diegans who missed it in theaters. 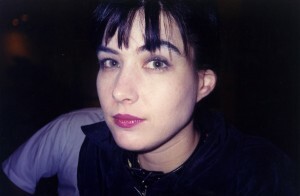 While not a mainstream name, alternative music artist Kathleen Hanna of Bikini Kill and Le Tigre took a notable absence from touring and recording in late 2005. Rather than write a public statement explaining her break to her large group of fans, Hanna got together with filmmaker Anderson to shoot a retrospective of her life and career, and explain her reason for abruptly disappearing from the music scene. In the era where punk and new wave were about to be replaced by grunge and R&B, college student Kathleen Hanna was studying photography, performing spoken word and being openly feminist. Male-dominated bands like Nirvana, Pearl Jam, Alice in Chains and Soundgarden were about to claim the next decade of music in Seattle, but by 1990, Kathleen had met two other girls and formed her own neo-punk band called Bikini Kill in Olympia. Most music fans of the generation might recognize Hanna as the girl who inspired the song “Smells Like Teen Spirit,” but to young women from 20 years ago she was an icon and idol of the third wave of feminism and girl bands. In 1998, Hanna switched over to an electronic trio called Le Tigre at the moment teen pop was taking over. The film begins with Hanna going into depth about her troubled relationship with her father, moves to her inspirational bond with her mother, then to working as a stripper when she was a teenager. Hanna herself, along with other female artists such as Tamra Davis, Carrie Brownstein, Joan Jett and Kim Gordon, go into great depth through interviews and concert footage about their exposure to the horrors of sexism, violence against women and the need for feminism through rock music. Her movement would be coined ‘Riot Grrrl’ and continues to inspire young female artists to this day (including fashion prodigy Tavi Gevinson, who is interviewed in the film as well). Hanna made a point that Anderson interview mostly female commentators for her documentary, as her story and message apply to primarily women. The exceptions being husband Adam Horovitz of the Beastie Boys and Bikini Kill bandmate Billy Karren. What’s great and fitting about the lack of male presence is that it isn’t even noticeable until the end credits. The big revelation that Hanna ends the movie with is that she has had Lyme disease since 2000. In a heartbreaking sequence she explains how she struggled to not know what the pain and numbness she was feeling for half a decade was before she was finally diagnosed. Tearing up, she explains how she lied to her bandmates and fans, saying she felt uninspired and too disinterested in music to keep going, when she was really too ill to carry on with the act. The documentary almost takes a completely different turn when Hanna admits to her illness and dishonesty. Up until now, we had seen this restless rebel girl with a fake Valley girl accent become friends with Kurt Cobain, get punched in the face by Courtney Love and even collaborate with Joan Jett and Kim Gordon. By the second act, it’s a bittersweet tale of survival between Hanna and her husband. Horovitz is shown being the one to give her medication and injections, and even went as far as shooting a scene himself that is a private moment between the two. Within a matter of minutes, Hanna is shown changing from a spokeswoman for her generation of feminists, to a vulnerable person who can’t control her body’s afflictions. Fans and viewers probably aren’t expecting such a somber ending to a documentary that started out so amped and then ends with their heroine so weak. Fortunately, Hanna and Anderson don’t let the change in tone effect their film negatively. The Punk Singer is so much more than just another documentary on a rock musician’s life, raising awareness for sexism and feminism, and the overlooked issues of Lyme disease. The film shows Hanna at her core: outspoken, radical and independent. Like a good documentary should, The Punk Singer can be fascinating to non-fans of Hanna, but will be appreciated the most by her following. After almost a full decade out of the spotlight, Kathleen Hanna comes back with a bang and then some. Megan Bianco is an Orange County-based movie reviewer and recent graduate of California State University Northridge.